Construct a top-notch game by using the assets offered by Unreal Engine, thereby reducing the time to download, create assets on your own. Learn to use Unreal 4 by making a first person puzzle game, Blockmania, for Android. This path is ideal for those who have a strong interest in game development and some development experience. An intermediate understanding of C++ is recommended. Unreal Engine technology powers hundreds of games. This Learning Path will help you create great 2D and 3D games that are distributed across multiple platforms. 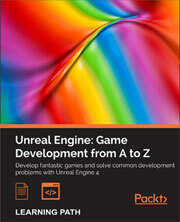 The first module, Learning Unreal Engine Game Development, starts with small, simple game ideas and playable projects. It starts by showing you the basics in the context of an individual game level. Then, you'll learn how to add details such as actors, animation, effects, and so on to the game. This module aims to equip you with the confidence and skills to design and build your own games using Unreal Engine 4. By the end of this module, you will be able to put into practise your own content.After getting familiar with Unreal Engine&apos;s core concepts, it&apos;s time that you dive into the field of game development. In this second module, Unreal Engine Game Development Cookbook we show you how to solve development problems using Unreal Engine, which you can work through as you build your own unique project. Every recipe provides step-by-step instructions, with explanations of how these features work, and alternative approaches and research materials so you can learn even more. You will start by building out levels for your game, followed by recipes to help you create environments, place meshes, and implement your characters. By the end of this module, you will see how to create a health bar and main menu, and then get your game ready to be deployed and published.The final step is to create your very own game that will keep mobile users hooked. This is what you'll be learning in our third module, Learning Unreal Engine Android Game Development,Once you get the hang of things, you will start developing our game, wherein you will graduate from movement and character control to AI and spawning. Once you've created your application, you will learn how to port and publish your game to the Google Play Store. With this course, you will be inspired to come up with your own great ideas for your future game development projects. A practical collection of bestselling Packt titles, this Learning Path aims to help you skill up with Unreal Engine by curating some of our best titles into an essential, sequential collection.